My freshly brewed Colombian coffee is on sitting on my desk. And I’m browsing through some sites to see what is going on in the electronics world. 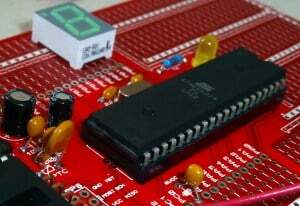 I just came across an article about Adafruit’s prototype of a new microcontroller board. I started looking at their SAM D series and the more I learn about them, the more I realize that they might be on to something really cool here! It’s a microcontroller with USB interface, and it’s available in a SOIC package. Since it has a USB interface, you’ll most likely be able to program it through USB without any programmer. And since it’s a SOIC package, it’s easy to solder it at home. When I wrote my microcontroller tutorial a year ago, I was struggling to find a microcontroller that could be soldered at home and had USB. The ATmega32U2 was my choice back then. It’s fairly easy to solder. But the SOIC are even easier! I’m going to learn more about these new microcontrollers. And I might create a tutorial later on. If you think this all sounds really exciting, but a bit complicated — I recommend you start building something easier. And you’ll see that you can quickly get to a stage where you can build much more advanced things.